Today, I was reminded on multiple levels how blessed I am to have community in my life. When I say “community”, I mean great co-workers, family, faith community, and friends who I can talk to. I am blessed with many who genuinely care. Because of my introverted tendencies, I could easily isolate myself and miss out on this blessing. When I first had the courage to talk to someone about my struggle with depression, this pastor who also struggled told me the importance surrounding himself with people and doing things for others. He reminded me that isolation is breeding ground for the devil to tear people to shreds. I almost find it hilarious that the devil tempted Jesus in Matthew 4 when Jesus was isolated. Jesus had removed Himself from the crowd and had been fasting and praying. The devil, knowing who Jesus is, still tried to tempt Jesus at His physically weakest moment. The devil even sunk so low as to twist Scripture. But Jesus had an arsenal. Jesus began to correctly use Scripture against the devil. You and I can do the same. That’s why we better know what the Bible says and know what it means in context. 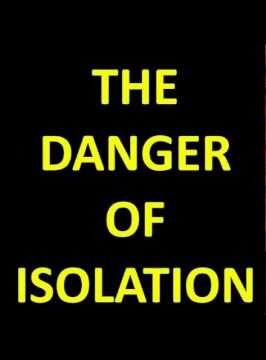 God has given you all the tools you need, but we must be keenly aware that we are the devil’s prey when we isolate ourselves and refuse to dwell in Christian community. That’s why Hebrews 10:25 is in the Bible, not as a guilt trip for those who don’t attend a fancy building with a steeple and stained glass three times per week but to encourage us to not forsake getting together as believers for the purpose of encouragement as the days are becoming increasingly wicked. When faced with the temptation to isolate yourself, pray for the courage to reach out. Even if it means picking up your phone. When God said “It is not good for man to be alone”, its implications go beyond God giving Adam a female companion. He wants you to have healthy community in your life. Amen! Pastors and (pastors wives,) can get really isolated, too. They’re often in a role, performing, leading,and so they can withdraw from people. There are a lot of churchians too,we put on a good front, tell everyone we’re fine,we’re blessed, so people can start to think our lives are perfect. I have this same struggle, my friend. When I seek isolation in my depression, the pit only gets deeper and darker. Depression whispers, “don’t reach out, you’ll get rejected.,” but God says, “reach outside yourself and find joy!” We need God. This isn’t the kind of thing we can survive alone! Wise words written here. Great post, Matthew. Beautifully spoken. I have an isolative spirit myself. I tend to alienate others because I have grown accustomed to my own company and it can be a dangerous place to be in with the enemy increasing his attacks. The wolves love to catch a little lamb alone that maybe has wandered off unawares from the protection of the other sheep…. Great post sir! True this. I’ve noticed that when I’m alone and left to my own devices, I begin thinking of things I shouldn’t be thinking of. It’s easier getting depressed when alone than in company. Your post hit home today for me. I’ve been there, and I’m thankful that God is using this to help others.